All in all, it was a very busy year at NWU and we’re better off for it. The elections aside, we still have many challenges ahead, the main one being how to grow, be more active, and better serve our members while, at the same time, cutting back on spending. This is a perpetual riddle for us. The Freelance Isn’t Free Bill was introduced into the New York City Council in December of 2015, and requires every independent contract worker to have a written contract paid within 30 days of the completion of work. Late payments or refusal to pay could trigger an escalating series of penalties. The main author was Sara Horowitz of the Freelancers Union; NWU signed on to it from the beginning. In February, VP’s Dave Hill and Mauricio Niebla testified in front of the City Council about their experiences with non-payment. Mauricio’s testimony in particular, was often referenced by City Council member Brad Lander, who was the bill’s main sponsor. 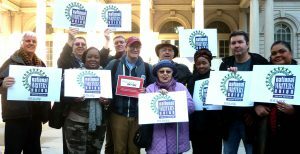 After much lobbying by a broad coalition of unions, community and tech groups, the first bill in the nation to make it illegal to stiff freelancers passed by a Council vote of 51-0 on October 27, and was signed into law by Mayor Bill de Blasio on November 16. 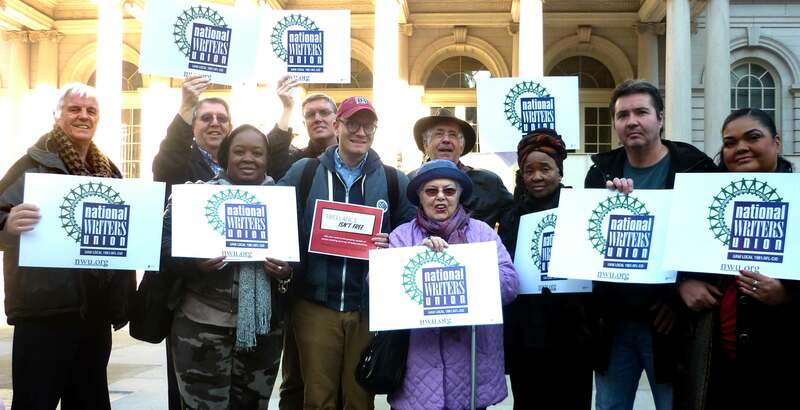 In addition to winning a significant reform that can help our members, the campaign strengthened our ties to a growing movement of independent, contract workers, who number between 55 and 60 million—roughly one-third of the US workforce. There are many complicated aspects to this issue, but by being involved in this campaign, NWU was invited to attend two important meetings. On October 6, we participated in the Future of Work meeting at the Cornell Workers’ Institute, and on November 17 we took part in the Evolution of Work symposium at the Federal Reserve Bank of New York. By being a part of these discussions, we can greatly expand our organization’s reach and influence, ensuring that independent, contract workers have a safety net that includes unemployment and health insurance, worker’s compensation, and be covered by federal labor and civil rights laws. Last June, I attended the International Federation of Journalists World Congress (IFJ) on behalf of the NWU in Angers, France. The conference focused on the threats to journalists around the world, and the campaign to End Impunity against journalists. Our role in IFJ has slowly been growing, and we continue to represent the organization at the UN in New York City. Because of our commitment to IFJ and the growing confidence other affiliate unions have in NWU, we were asked to nominate a candidate to represent IFJ (and all creators) on the Board of the International Federation of Reproduction Rights Organizations (IFRRO). We proposed Book Division Co-Chair Edward Hasbrouck, who has been the union point person on copyright issues, and who authored our comments to the US Copyright Office and our statement on the firing of Maria Pallente, who was register and director of the US Copyright Office. Edward recently returned from the IFRRO Annual General Meeting in Amsterdam, where he was elected to a three year term on the board. While there, he also attended the IFJ Executive Committee in Brussels. This is potentially a big advance for NWU in the struggle for greater copyright protections, and in our ability to work with colleagues around the world. Please see Edward’s report on this international work. In July, the Grievance and Contract Division unveiled the NWU webinar on e-books, and in that same month, members Chris Savage (SEM), Cecil Bothwell (A-L), Tom Prezelski (Tucson), and Deb Kozokowski (Boston), served as delegates to the Democratic National Convention in Philadelphia. NWU had booths at the Writers’ Digest Conference, Netroots Nation, and 2nd VP Pamela K. Johnson brought home the top prize for the best UAW website at the LUCA Conference.VP Dave Hill represented us on a panel at the Excellence in Journalism conference of the SPJ. NY Chapter Co-Chair Yusef Salaam represented at the UAW Chaplaincy conference. We gave support to the Verizon strikers and fellow UAW members who are locked out at Honeywell. We expanded our role in the Workers Unite Film Festival as our members were judges for the screenplay contest, and we sponsored a night for a screening of NWU member Kathleen Foster’s film, Profiled. The chapters were active too. Boston held its annual Book Party, celebrating those members published in the previous year, and the SoCal chapter held Latinex, a reading in Los Angeles. The SoCal and NoCal chapters held two joint events, and NoCal had a booth and a panel at Lit Crawl. The DC Chapter also held a number of events, and the NY Chapter held its fourth annual conference and represented at the Harlem Book Fair, the Brooklyn Book Fair, and the Black Writers Conference at Medgar Evers College. And we marched in the Labor Against Hate contingent on Pride weekend after the brutal massacre in Orlando, FL. To any person or chapter I might have left out, my apologies. But let me say, this Year-In-Review reflects a real union that is standing up and fighting back in a most difficult time. And while the challenges are growing, we are better equipped to meet them. I want to wish you all a happy and health holiday season. And get some rest. We’re going to need it!